Timing turned out just perfect – leaving Khartoum on schedule, we started yesterday our final field season on Sai Island. The first task was to re-open Tomb 26 – removing the filling of its more than 5 m deep shaft was a bit dusty, but worked out very well thanks to our enthusiastic gang of workmen supervised by Hassan Dawd. And even more perfect: New Year started with re-opening the main chamber of Tomb 26 earlier today. All is in perfect condition, almost no collapse of the ceiling occurred. 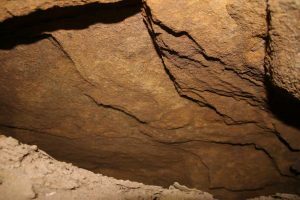 We will concentrate on the northwestern corner of the chamber which was not yet completely excavated – and we are all very excited about the new chamber found at a lower level along the north wall in the very last days of the 2016 season. Clearing this chamber of still unknown dimensions will keep us busy this season. I’ve cleared some of its entrance area today, but it is almost completely filled with flood deposits – making a proper assessment what to expect from this new chamber very difficult. However, the six pottery sherds which came today from the entrance area are all New Kingdom in date – interestingly, one seems to be of 19th Dynasty date. Will we maybe be able to re-locate Hornakht’s original burial after all? 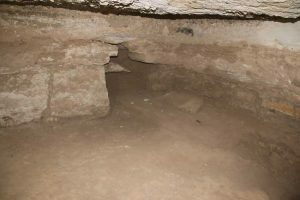 Just follow our blog for the current field season and our findings in Tomb 26! Although 2017 has just started, the new year is definitely full of exciting prospects :-)! 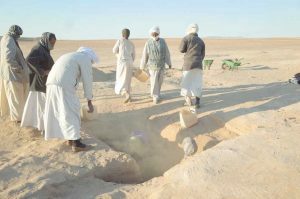 This entry was posted in 18th Dynasty, 19th Dynasty, Archaeology, Fieldwork, New Kingdom, Sai Island, Upper Nubia and tagged Hornakht, SAC5, Sai Island, tomb 26 by Julia Budka. Bookmark the permalink.